“The market told us they wanted a rugged (IP68) wearable to keep responders and field workers connected, protected and situationally aware even if they were doing rescue operations in flood waters”, says Mike Morrow, CEO. “They asked for a low cost solution that didn’t require purchasing smartphones to communicate, would operate continuously for over 12 hours, minimize equipment burdens for the responder, allowed for covert operations and supports voice-to-text or push-to-talk capabilities. Sending alarms when a responder’s heart rate exceeds configurable safety thresholds is a unique capability of the smartwatch”, explains Morrow. The Samsung Gear S3 watch, and the newly announced Galaxy Watch, allow for dynamic switching between Bluetooth Tethered and standalone Wi-Fi or LTE connections. The watch can be used with iPhone and Android smartphones. The CommandWearResponder Watch™ app is available at no charge with a CommandWear software subscription. The app will be available in the Samsung Galaxy Apps Store once the Galaxy Watch is released. 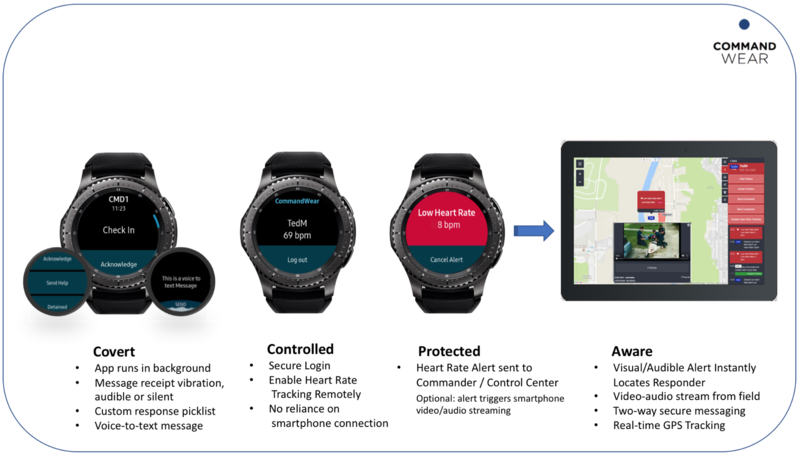 The Responder Watch app runs on both Samsung Tizen and Android Wear 2.0 compatible smartwatches. Other smartwatches can also be used with CommandWear’s software for basic two-way messaging functions. Founded in 2013, CommandWear is an award-winning wearable and mobile situational awareness software developer. The International Forum to Advance First Responder Innovation (IFAFRI) published a list of “Common Global Capability Gaps” and sited “The ability to know the location of responders and their proximity to risks and hazards in real time” as a priority global requirement. CommandWear continues to address critical needs of first responders and was one of ten start-ups selected to participate in the US Department of Homeland Security 2016 EMERGE Wearable Technology Accelerator Program, the 2018 SCITI Labs‘ “Smart Hub” program. The company continues to innovate to make our communities safer and was recognized by the World Information Technology and Services Alliance’s and presented with an Emerging Digital Solution award and selected among the recipients as the “company most likely to have a significant positive impact in the world”.